The Necchi HD22 has an Aluminum alloy body and is built to last! This sturdy machine is the perfect for your heavy duty projects, reliable and easy to use. The carrying handle is convenient for those times when you want to take your machine along with you. Store all your extra feet in the accessory compartment. This particular machine is Treadle compatible. 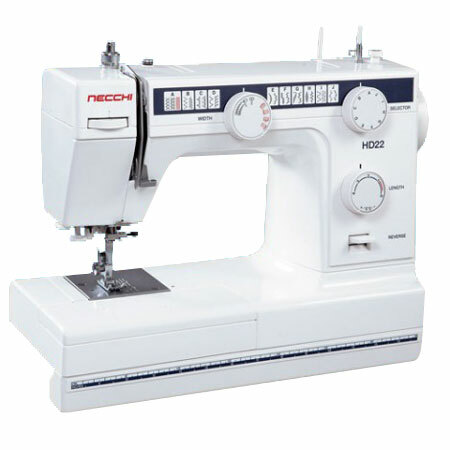 The HD22 features 22 built-in stitches and a four-step buttonhole. The dials on the front of the machine allow you to choose the desired stitch. The built-in needle threader makes threading the needle a snap. Features also include an easy reverse lever, drop feed and foot pressure adjustments. The HD22 also has a front-loading bobbin system and Auto-declutch bobbin winding. The free arm lets you tackle the hems of pants and shirt cuffs with ease. This Necchi HD22 includes FREE 1/4" and rolled hem feet. These are not packed with the machine by Necchi. We are offering them as a promotion.